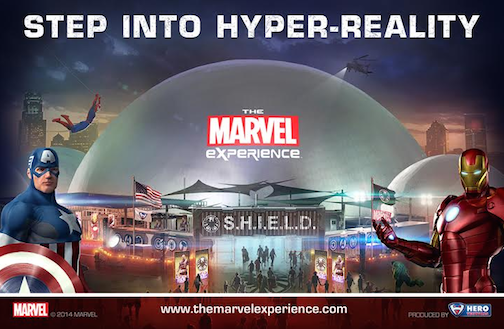 **CONTEST CLOSED** Step into hyper-reality with The Marvel Experience: The World’s First Hyper-Reality Tour! This exclusive national tour launches at Salt River Fields at Talking Stick in Scottsdale this December. The Marvel Experience is an unprecedented interactive event that spans over two acres. Be the star of your own comic as you swing with Spider-Man, smash with Hulk and fly with Iron Man in next generation hyper-reality. Tickets are on sale now through Ticketmaster, but you’re in luck! This Ticket Tuesday we are giving away a pair of tickets for a select day of The Marvel Experience. To enter our Ticket Tuesday giveaway, tell us in our comment section what superpowers you wish to (or already) possess. We will select a winner using random.org. We’ll allow 24 hours for commenting. Winners will be notified by e-mail sometime on Wednesday, November 12. Comments are moderated and may take some time to appear. Please do not resubmit your comments — one is plenty. For more information on The Marvel Experience, please visit the website at www.themarvelexperience.com. Here’s to an event of epic proportions! To be able to use 100% of my brain function – a “Limitless” type of thing. Too many things going on up there. Would be nice to have more hard drive space. Omnipotence! Just like Thanos when he had the infinty gauntlet. I would want the ability to phase my body and become incorporeal on command. I would definitely wish for the power to shape shift. It would be insanely useful to transform into a bird and fly to my destination or turn into a small mouse and scamper into hidden locations. There are so many possibilities, it would be a limitless superpower! To be able to speed read! Too many books, so little time!